Game playing was an important part of my growing up. Some of my fondest memories of my dad are those in which he's explaining the intricacies of a cribbage or backgammon move to me, or rolling 6's three times in a row, or having to blow on the dice to keep them lucky for him. 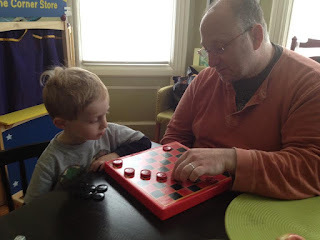 Not sure how my son discovered checkers, but AA had a hankering to learn how to play (and he wants to learn to play chess too! ) Bring it on! We're going to master checkers, and then move on to chess! This is one of the joys of being a dad-- introducing your kid to the things you love!